Nokia is expected to unveil a new smartphone with a 41-megapixel camera on Thursday, banking on advanced optics to make up for meager marketing resources and a limited range of phone apps. Analysts, however, are skeptical that a new camera for the flagship Lumia smartphone will be enough for the Finnish company to regain market share from rivals Samsung and Apple. Several said that Nokia needs to market the handsets more aggressively - a tough challenge in the face of its dwindling cash reserves after years of poor sales and the decision this month to buy Siemens' stake in their equipment joint venture. "What I'm expecting to see is a powerful device that will differentiate it from competitors' high-end handsets. But whether this will be enough to compete with Samsung and Apple? I doubt it," said Francisco Jeronimo, of research firm IDC. "They need to raise the level of awareness. They may have the best camera, the best maps, but if consumers don't really know what they can do, that's not enough." Nokia Chief Executive Stephen Elop, hired in 2010 to revive the former mobile phone market leader, has bet the company's future in smartphones on Microsoft's Windows Phone operating system. While simpler feature phones still account for a bulk of Nokia's handset shipments, smartphones are viewed as crucial for its survival because of their higher margins, increasing demand for Internet access and consumers' growing tendency to switch to cheaper models made by Asian manufacturers. While existing Lumias have won positive reviews from critics and technology blogs, they have struggled against Samsung's handsets, which use Google's Android operating system, and Apple's iPhones, which run on iOS. IDC estimates that Android and iOS accounted for 92.3 per cent of all smartphone shipments in the first quarter of this year. Windows Phone, meanwhile, accounted for 3.2 per cent, with a shortage of apps proving a major handicap. Windows Phone has only 160,000 apps in store, while rivals offer about five times as many because developers prefer to make them for the higher-volume operating systems. The new phone to be unveiled on Thursday is expected to be the most advanced of the Lumia range. Nokia already has a 41-megapixel camera on its 808 PureView phone, but that model runs on the Symbian platform, which is being phased out. The camera on the 808 PureView, which uses Carl Zeiss optics, has been widely praised for taking high-quality pictures even after zooming. 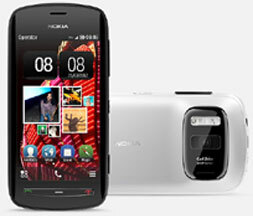 A 41 megapixel count far exceeds those of the iPhone 5 and Samsung Galaxy S4 Zoom, at 8 and 16 megapixels respectively. It is also higher than some compact cameras, though the number of megapixels does not necessarily mean better photos because factors such as lens quality also affect the end result. Recent Lumia phones have also emphasized advanced camera features, including the Lumia 920's "floating lens" technology to adjust for camera shake and six-lens optics on the Lumia 925 to produce sharper images. Nokia has not given details about the latest upgrade, but a source confirmed that the camera technology would be its main selling point and the company's own website promises "41 million reasons" to tune in to the event in New York. While analysts say it is crucial for Nokia to boost marketing and promotions through its carrier partners, the company is likely to keep a wary eye on its marketing expenses. Nokia said last week that its net cash position at the end of the second quarter was between 3.7 billion euros and 4.2 billion euros ($4.7 billion to $5.4 billion), indicating that cash burn may have been as high as 800 million euros in the quarter. Ratings agency Standard & Poor's downgraded Nokia by one notch on Friday to B+ from BB-, forecasting that net cash could fall as low as 1.3 billion euros at the end of the year. A portfolio manager for one of Nokia's top 10 institutional investors, who declined to be identified, said he is not in favor of Nokia boosting marketing spending too much and is happy with a slowly-but-surely approach. Alandsbanken analyst Lars Soderfjell, too, said Nokia should aim for modest marketing - enough to improve sales and buy more time for a turnaround without accelerating cash burn. "I look at this as a very gradual turnaround. I don't see there being a silver bullet model ... If it can gain a couple of percentage points in market share, then it can gradually recover," he said. IDC's Jeronimo suggested that Microsoft should also do more to market Windows Phone handsets. Without Nokia's commitment to Windows, Microsoft would have no leading handset partner.